WELCOME to the 30th issue of BYMRr-Zine - a free newsletter published by Building Your Model Railroad, devoted to providing breaking news and tips to model railroaders of all ages and all scales in a quick and easy-to-read format. Resources are always credited where appropriate. I have mostly been an indoor model railroader over the past 20+ years, but this year, since a space became available in the back yard near the patio, and with my wife's permission, I have decided to bring the hobby outside. I think it's always good to start out small. So I purchased a Bachman G scale train set and a few extra track pieces from Amazon online for under $300. I cleared away a little section of land near the patio that would be visible from inside the house. I laid out the track sections loosely on the ground and arranged what I thought would be an interesting track design, though I was somewhat limited by the amount of track and the space that was available to me. I wanted more than just an plain oval or a circle of track, so I developed an oval, kidney-bean shaped design with several places containing straight sections that would be appropriate for passenger station and freight stops. This would give a purpose to the railroad and places for the train to arrive and depart from. I wanted to keep it simple at first, figuring that I can always expand on it later. I decided not to have any branch lines or turnouts right now in order to reduce the work of getting it started and avoid problems with derailments. I first cleaned all the vegetation away from the area where I wanted to put track down. Then I dug out a 3 inch deep ditch using hand tools and over-filled the ditch with small-sized crushed rock which I had purchased from the local landscaping store. 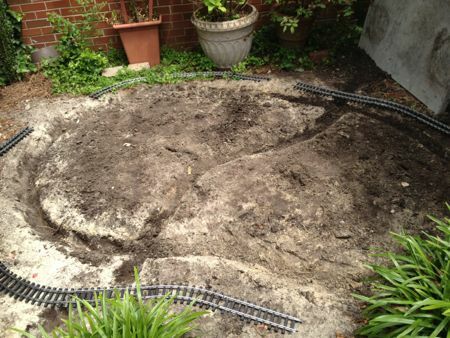 I added enough rock to elevate the track level about an inch or two above the ground. Round rock won't do because it won't hold its shape or provide good enough support for the track. This rock-filled ditch does two things: It serves as supporting roadbed for the track and provides good drainage to avoid having water lay on the track after a rain. 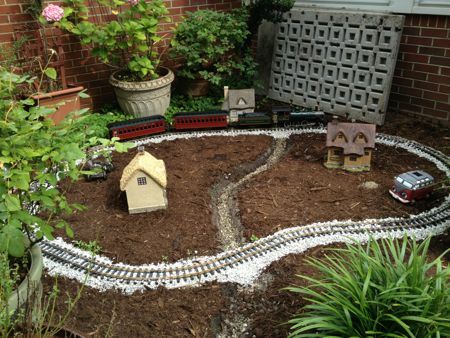 For even better drainage, I decided to add a creek filled with brownish tan-colored rocks that would carry water away from the layout to a loser part of the landscape. I might consider adding a pond and a small water pump later so that the creek will always have flowing water. For now, it's just a creek-bed. The track that came with the set is not galvanized and will likely rust after a while. I will probably have to replace it at some point with galvanized track. You may want to purchase the galvanized track in the beginning so you can avoid this step later although it's more expensive. I'm planning to coat the track with Goo Gone or transmission fluid to enhance the electrical contact which may be spotty if the track is rusty. 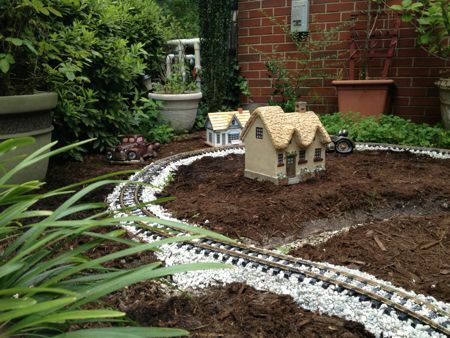 After creating the roadbed and creek-bed, I spread some regular hardwood mulch over the area, then added a few buildings and vehicles for interest. I purchased these from a local Plow and Hearth store, but they are also available online. The vehicles are equipped with solar panels to make the headlights come on at night. I plan to add lights to all the buildings later as well. Now all I have to do is add some small plants and perhaps add some larger individual rocks or groups of rocks for mountains. I am hoping to build a least one small bridge for the track over the creek and one tunnel. So far, it hasn't taken very long to do it, although, I must say, it is a little more physically demanding than building most indoor layouts. Nevertheless, it has been fun doing it and I definitely plan on adding to it later. For this month, I just wanted to get the basic layout started. Adding on will be easy. ~ A small point-and-shoot camera allows for better camera placement in small areas. ~ Get greater depth of field by using a camera with macro capabilities. You can also use software called Helicon Focus that allows you to take several images of the same scene using front, middle and rear focusing points and combine them into one photo that has a sharp image from the front to the back of the scene. ~ Adjust for lighting. You should be able to manually adjust the exposure value on your camera to compensate for under lighted areas. White balance adjustment will also allow you to adjust for different light sources like fluorescent vs. tungsten light. ~ Make sure your lighting is adequate. Don’t rely on the flash. In fact, it would be best not to use the flash on the camera at all. ~ Ideally, your camera should have a live-view screen so that you can see what the picture will look like before you take it. A vari-angle screen is a plus, since it will enable you to view the scene from the side or the back of an area which your eyes could never see without a mirror. ~ The camera should have good optics for optimum picture clarity. ~ An inexpensive photo editing software program like Arcsoft Photo Studio, which is much easier to use and less expensive than Photo Shop, is adequate for touching up photos and cropping. If you want to lighten one area and darken others, or use layers, a program like GIMP, or Lightroom may be more helpful. If you don’t already have a backdrop for your layout, or even if you do, consider making a portable 2x4 foot backdrop. just for photos. You may want to use actual enlarged photos of city scenes, mountain scenes, different seasons, etc. pasted onto poster-boards. This would allow you to create many different photos using the same area of your layout photographed with different background scenes. Or, instead of making your own, consider using prints from realisticbackgrounds.com which are printed on 15-point CIS board measuring 13” high and 38” wide, selling for about $10 each. Reference: “Expanding Your Layout’s Horizons” by Arnie Steiner, N-Scale Magazine, July/August 2013, pages 43-47. 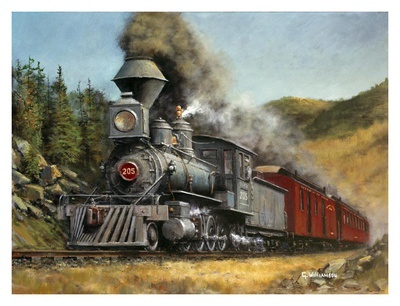 If you are new to the hobby, you may be looking at the variety of train sets that are available as start-ups. Most of these sets are made for regular analog or DC control, which will run your one locomotive just fine, but if you want to run a second or third locomotive, you either have to go to the more complicated cab wiring for DC, or you have to replace your locomotive with one that has a DCC decoder and replace your power pack with one that provides DCC control. If you are at all thinking about expanding your small layout from single-train to multiple-train operation, you should really consider starting with DCC right up front. There are now a few starter sets that use DCC power with locos that already have a decoder installed. This will allow you to enter into the DCC world right at the beginning. If you want to add more locomotives later, it's easy! You just have to purchase the ones that already have the DCC decoders installed. You can install your own decoders if you wish, but unless spending a lot of time at the workbench is want you want to do, I would suggest buying locos with the decoder already installed. Believe me, it will save you a lot of headaches. Now you can control multiple trains on the same track - forward or reverse, some fast, some slow, some stopped - using one AC powered DCC controller. One of these starter sets that I saw recently was a Walthers Railtech set which supplies an entry-level DCC controller and a DCC decoder-equipped, all-wheel drive, flywheel locomotive along with four cars and enough Bachman E-Z track sections for an oval for around $225. The set had a very good review in Model Railroader , May, 2013, p 64. Sounds like a perfect way to get started. 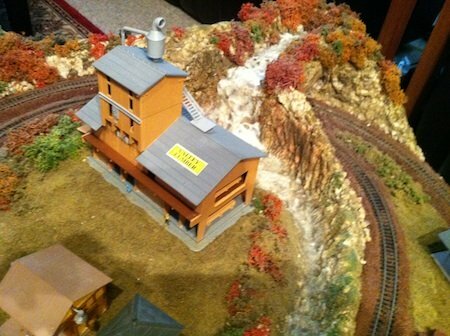 Do you have a headquarters for your model railroad? According to a recent article that appeared in Railroad Model Craftsmen, June 2013, on page 38, every railroad has a headquarters building, some larger, some smaller than others. It doesn't have to be massive, like Grand Central. It could be just a regional headquarters building. I don’t have one on my layout at this point, but I think as a result of this article I am going to make one. It may add some validity to my freelanced Blue Ridge and Southern Company. You can either scratch build it or buy a basic ready-made building and modify it with banners, signs and/or flags to make it look like your model railroad headquarters. Great idea! If you are one of the many model railroaders who love train operations, you must consider at least looking at the opsig.org website and maybe even joining the organization, called the Operations Special Interest Group, if you haven't already done so. Their purpose, as stated on the site, is to "discuss, develop and disseminate ways of operating model railroads to realistically emulate practices of the prototype." They provide a lot of guidance and support to those who are interested in this fascinating aspect of the hobby, and can help organize your operating sessions. You may even want to consider buying their book, 19 East, Copy 3, by Sprau and King. Learning the art of train table and time orders (TT&TO) is at the heart of most good operating sessions and OPSIG is the the organization that can show you how to do it right. 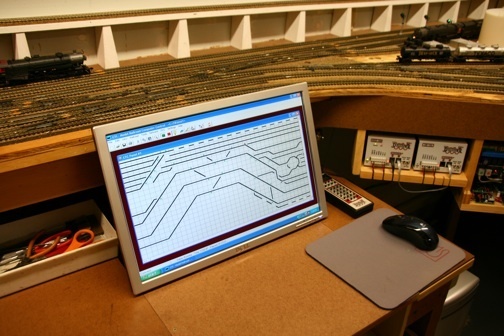 Their quarterly journal, called The Dispatcher's Office contains lots of tips, advice and guidance on prototypical train operation and shows you how you can best simulate that on your layout. A ton of references and resources are listed on their website as well. Reference: Railroad Model Craftsman , June 2013, pages 22-28. ~ Use popsicle sticks to create small loading docks to use at various places along the track. I like to use them to cover up those unsightly Atlas remote turnout switches. ~ Paint the electrical knobs on your telephone poles green. Use thin black or brown fishing line glued from one pole to another to simulate electrical cables. Also, if there is a building near a pole, attach a line from the top of the pole to the back wall of the building to provide "power" to that structure. ~ Purchased model railroad bridges can be modified to create highway bridges by placing a cut piece of brown, black or gray roof shingle over the surface of the bridge deck. Use the rest of the shingle to make roads leading to and from the bridge or for other roads that you want to model on your layout. ~ Create little spotlights to light up your buildings and industries. Shape a piece of tin foil around an LED light or a small grain-of-wheat bulb. Place it on your layout in front of the building (or billboard) that you want to show off. Bury the wires under the ground cover. You can connect the wires to a nearby set of rails (track) to power the light or you can connect them to bus wires under the layout. ~ Make mud puddles. First, lay out a sheet of wax paper with the shiny side up. Mix a small amount of white glue with brown or blue acrylic (water-soluble) paint. Add a little water for thinner if necessary. Use a dropper to drop small puddles of this mixture onto to the wax paper. The next day after it dries, you can peel these puddles off the paper and glue them down to the sides of your roadways or wherever you want to put them. 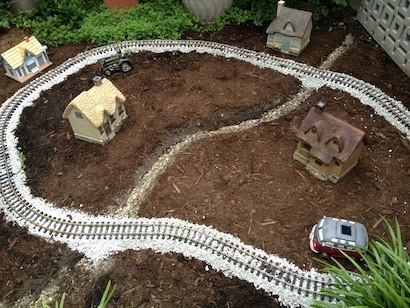 There are a lot of uses for a stone wall on a model railroad. You can use it as a retaining wall, a foundation for a building, a cobblestone highway, the sides of an arched bridge, etc. Just take a piece of cardboard cut to the shape and size that you wish. Spread glue on the surface and add a layer of whatever style or type of small stones that you want to use. You can also apply a layer of thinned white glue over the stones for extra hold. The white glue will dry clear. After all the glue is dry (24-48 hours), spread dry wall compound, Portland Cement or Hydrocal plaster over the surface of the stones using it to fill in all the open areas between the stones. (If you want to add color to the "mortar", mix an appropriate amount of acrylic paint (tan or gray) to the plaster before applying it to the stones). After this dries you're ready to mount it to your building or to the side of your bridge, or wherever else you want to put it. This will definitely add a slice of realism to your scenes. A new radio-controlled remote uncoupler has been developed by Kadee (www.kadee.com) for G-scale, designed to work with either freight or passenger cars and is completely wireless. It doesn’t require any track signals. There is a beginner’s set in G-scale available which comes with everything that you need. The basic starter kit for G-scale is priced at around $345. Reference: Railroad Model Craftsman, June 2013, page 20. The spotlight in the BYMRR newsletter for this month is the Cincinnati and Southern Railroad built by Ken Heyl, started in 1991 and still expanding. What an empire! This newsletter is created for free. If you find that it's entertaining and/or useful, please consider a small donation to support the cost of developing and maintaining it and for the considerable time required in researching and writing the content.